CURRENT WEATHER...........6/8 cloud - decreasing, haze. LAST 24 HOUR MAX WIND GUST..NE 40kph at 1612. PAST 24 WEATHER SUMMARY...Slight showers either side of midnight. So Access-R now has a decent spread of showers/storms across SEQ and NENSW in the early afternoon, favouring border regions. EC still has about the same. Yes was thinking that it certainly feels like a storm day for Brisbane and the coast to me sitting up in Toowoomba. I don't think we will see it this far out but plenty of moisture still lingering around if that westerly can just hold off long enough. The odd cloud popping up now. 7mm last nights storm. Only suppose to reach 31C today but already feels like that now. Quite a humid, gusty NW breeze. I didn’t see any electrical activity here last night, although we did get a fraction of a mm overnight. Looks like we will set that record for driest November on record. Forecasting 39C for Monday. Time to move to Tassie! Lol. Ipswich forecast now at 43C for next Monday. Archerfield at 40C. And this with a 21C dewpoint. So not really dry heat. Quick moving storms moving SE towards Killarney area. Unstable looking sky here. Might have spoke to soon this storm cell might just skirt past here and hit further south.Maybe more to come hopefully. Thunder heard to NW of Wynnum Nth at 1220. Jist curious has the capping been broken and where currently is the westerly wind change ? The dryline is over the Brisbane Valley near Amberley. 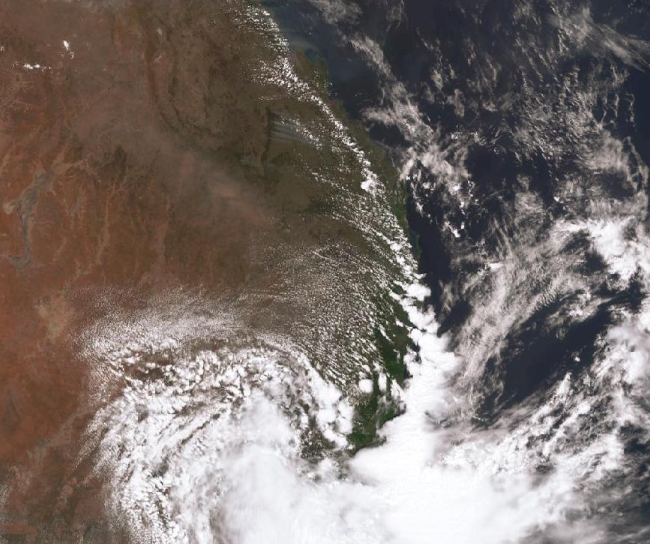 It's all over for SEQ except for far coastal regions, but the storms could bomb offshore. Considering there was a chance we might not see anything today it's not a bad effort. A real wasted opportunity though. If only the front had pushed through a few hours later. The capping was always forecast to erode by around lunchtime today. NSW BOM warning for giant hail near the QLD border. For people in Gold Coast, Redland City and parts of Logan, Brisbane City and Moreton Bay Council Areas. Issued at 12:32 pm Wednesday, 28 November 2018. Storms developing near Brisbane and the Gold Coast. The Bureau of Meteorology warns that, at 12:30 pm, severe thunderstorms were detected on the weather radar near Albany Creek, Enoggera and Nerang. These thunderstorms are moving towards the east to southeast. They are forecast to affect Coolangatta and Cleveland by 1:05 pm and Point Lookout and Amity Point by 1:35 pm. Blowing a gale out here, sadly no storms for me. Pressure down to 995. Feels so unusual to be that low without a major rain event, just like over the weekend.